Roo's mother. When she leaves her house, she just pops little Roo into her pouch and off they go. Kanga is always ready with kind and gentle advice for her neighbors in the Hundred Acre Wood. Kanga is a character from the 100 Acre Wood appearing in Kingdom Hearts II. Though her world has been shown in the games, she does not appear until the third installment. She is based on her appearance in Disney's Winnie the Pooh franchise. Kanga is Roo's mother. When Kanga hears from Piglet that Pooh has forgotten everything about his friends, she makes a medicine in attempt to restore his memory, but Tigger steals it, thinking it is a present for him. Later, she helps Sora search for Pooh in the Spooky Cave. She later joins the rest of Pooh's friends in saying goodbye to Sora at the Starry Hill. Kanga makes a brief cameo appearance alongside Roo when Pooh and Piglet explain to Sora on what has happened to their friends. 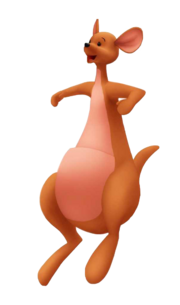 Kanga is an animated plush doll of an adult, female kangaroo with light brown fur covering most of her body, except for her belly, pouch, and the insides of her ears, which are pink. She has large feet that lack toes and comparatively smaller arms. The only distinct digits on her hands are her thumbs. She also has a somewhat short tail. Kanga's ears are quite large and her neck is rather long. She has beady black eyes and a black nose. Kanga is the sweet and caring mother of Roo. She also acts as a gentle motherly figure to the other Hundred Acre Wood characters, giving advice and help to those in need. Kanga first appeared in Winnie the Pooh and the Honey Tree. Kanga plays a minor role throughout the movie, which is the mother-figure. She briefly appears at Christopher Robin's house in the beginning, and later appears when Pooh is stuck in Rabbit's front door to give Pooh a bouquet a Honeysuckle as a gift and to help pull Pooh out of the hole when he budges. Her name, Kanga and her son's name Roo, when put together, make kangaroo. Though her current voice actor, Kath Soucie, is part of the Kingdom Hearts II cast, voicing Sally and Shock of the Halloween Town world, for some reason, she does not voice Kanga here. This page was last edited on 3 March 2019, at 09:35.